Before work, I rode Wizard in the outdoor arena with Kris and Sunny. He was tense and irritable during the beginning of the ride, and it took some transitions and lateral work to loosen him up a little. When I asked for a trot lengthening, he bounced into a canter and fussed a bit. Over trot poles and a small crossrail, he was perfect. While we were cooling out, Wizard stumbled and went down to his knees. He recovered quickly, but I’m concerned about him. He also loosened a nail in his left hind shoe, so the farrier tapped the nail back in the following day. He also used his hoof testers and felt around for heel pain (navicular) and tenderness in his feet. Nothing out of the ordinary. The September weather is ideal, but I have not ridden much since Wizard has tripped/stumbled a few times. I talked to the farrier, and I am also planning to talk to the vet. On Friday, he was very tense under saddle, and was also goosey during tackup and grooming. After about 15 minutes of riding, I got him to settle a little, and we did some walk/trot work. He trotted nicely over trot poles and a tiny crossrail. When his trot improved, I asked for a lengthening, and pfffft, a stumble. Oh well, I guess he’s on vacation again until we get this figured out. After work, I took a drive to the barn and met up with Kris and Sunny. It was dark out, but Wizard walked right up to me when I went in his paddock. Kris was finishing up a ride when I brought Wizard into the indoor. I groomed him and put him on a longe line for just a few minutes to see what he looked like. Twice at the walk, he tripped just a little bit. Nothing at the trot. 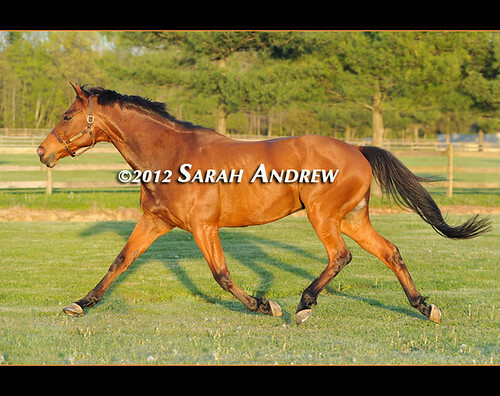 And when I asked him to canter, he give me an extremely athletic buck and scampered around like a nut. After I gave him his evening snack (Triple Crown senior feed and a little rice bran), I put him back to bed in his paddock. Are we dealing with a funny knee? Tender feet? Something worse, like neurological symptoms? I’m not sure, but I want to get to the bottom of things. Way back at the beginning of this, I asked Luie’s vet what we’d do if the doxy didn’t work. She said it would take a different antibiotic – sounded as tho there are several choices. FWIW her doxy dosage for Luie was 30% higher than what the dispensing vet recommended, but would only be administered for 21 days, not 30. Vet has reassured me several times that the doxy plus the homeopathics (8 30c Ledum P and 8 30c Rhus Tox each day for the 21 days) has cured *every* case of Lyme she’s come across. Needless to say, I’m knocking on wood that her success rate continues and Luie’s not her first clunker! Janet, Luie’s vet – Jana Froeling- knows Dr. Kiefer. Thanks! It’s such a beautiful day here…*has* to be good news out there!